When you think about learning a new language, how do you imagine doing it? In the olden days, new skills of this kind were typically gained either by spending hours and hours in front of a textbook or in a classroom. In some cases, learners were able to pick up a new language by completely immersing themselves in it. Though in the past these separate methods were available for learning a language, it was more difficult to find a single educational method that combined all three options. This is a shame as combination learning is often very effective. Indeed; there are suggestions from many academic sources that human beings learn better when information is presented to them in a range of different formats. Today, the reality could not be more different. The digital revolution has created an educational sphere where it is normal for a variety of different learning tools and experiences to be put together to form one complete programme. 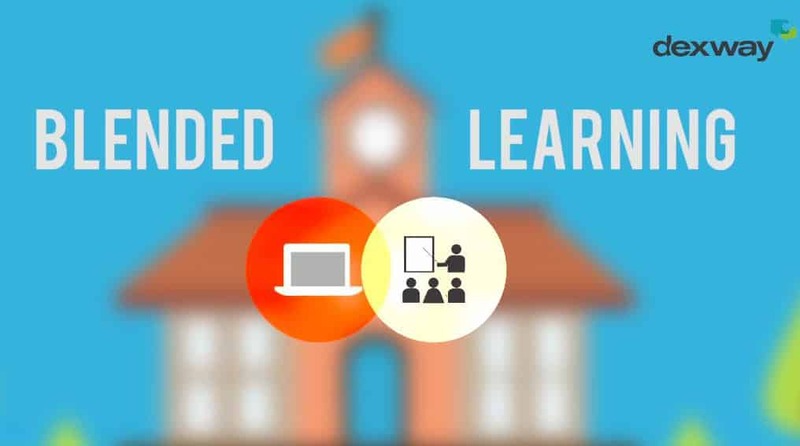 This is where blended learning comes in. Have you seen this term on an offline or online language course description and been unsure about what it actually entails? Don’t worry: there is actually a very simple explanation. A blended learning programme is any type of class or course that incorporates both traditional classroom based teacher learning and digital self study. This can included flipped classroom style programmes where learners are encouraged to use classroom time for group work and discussion, and self-study time for watching video lectures, reading course texts and accessing revision exercises. How does a blended learning programme compare to a standard online language course? In the past, online language training was typically a solitary activity. Learners would access an online language course in order to learn vocabulary, practice sentence structure and exercise reading skills. This type of online language training didn’t typically have any social element to it, which can be a downside. In comparison to this, blended learning programmes were often considered to be the best of both worlds. Learners were able to benefit from easily accessible digital learning activities that fit into their lives, but were also able to work with a teacher and classroom peer group to practice speaking and listening skills, get personalised feedback and receive tutorage and guidance. However, this split is not quite so clear anymore. Many online language training providers have seen just how beneficial blended learning inspired training can be, and have sought to build these learning principles into their online language course catalogue. Can an online language course successfully incorporate blended learning elements? Virtual classrooms and online learning communities have opened up all kinds of opportunities for online language training providers. Taking an online language course no longer has to be a solitary activity! Instead, learners can choose online language training safe in the knowledge that they will be getting the support of a language tutor and the benefit of building relationships with fellow students. How does the Dexway method fit into this? The Dexway method takes these learning principles very seriously. It is very important for online language training to offer learners plenty of opportunity for authentic language immersion. Voice recognition technology: during learning exercises the online language training programme will be able to feed back to students on their pronunciation. Virtual classrooms: learners will be able to benefit from classroom style learning, wherever they choose to access it from. Conversation groups: at the click of a button learners can choose to join a conversation with other learners from across the globe. This is ideal for speaking and listening practice. Real time monitoring: the Dexway method holds monitoring in very high regard. The real time monitoring tools ensure that both learners and tutors are able to access learning statistics that will help them stay on track. You can see a full list of Dexway online features here. Which option is right for you or your students? One of the best things about education in the digital age is that there are so many different ways to learn. Potential students can choose the kind of educational method that suits them best at the time they need it, whether it’s a more traditional face-to-face course with blended learning elements, a completely self-paced online language course, or an attractive mix of the two.